When today's doctors prescribe an antibiotic to fight infection, they are trying to put the patient's body back in balance. While the drugs and medical explanation may be new, this art of balancing bodily fluids has been practiced since Hippocrates' day. I do anatomize and cut up these poor beasts, he said to Hippocrates, to see the cause of these distempers, vanities, and follies, which are the burden of all creatures. Earth corresponds with black bile. Too much earth made one melancholic. Air corresponds with blood. Too much air, sanguine. Fire corresponds with yellow bile. Too much fire, choleric. Water corresponds with phlegm. Too much water, phlegmatic. Finally, each element/humor/season was associated with certain qualities. Thus yellow bile was thought of as hot and dry. Its opposite, phlegm (the mucus of colds), was cold and moist. Black Bile was cold and dry, while its opposite, blood was hot and moist. As a first step, the prudent Hippocratic physician would prescribe a regimen of diet, activity, and exercise, designed to void the body of the imbalanced humor. According to Gary Lindquester's History of Human Disease, if it was a fever--a hot, dry disease--the culprit was yellow bile. So, the doctor would try to increase its opposite, phlegm, by prescribing cold baths. If the opposite situation prevailed (as in a cold), where there were obvious symptoms of excess phlegm production, the regimen would be to bundle up in bed and drink wine. If the regimen didn't work the next course would be with drugs, often hellebore, a potent poison that would cause vomiting and diarrhea, "signs" the imbalanced humor was eliminated. We might assume such Hippocratic ideas sprang from speculation rather than experimentation, but observation played a key role. Furthermore, it would be simplistic to say ancient Greco-Roman doctors never practiced human dissection. If nothing else, doctors had anatomical experience dealing with war wounds. But especially during the Hellenistic period, there was extensive contact with the Egyptians whose embalming techniques involved removing bodily organs. In the third century, B.C. vivisection was permitted in Alexandria where living criminals may have been put to the knife. Still, we believe Hippocrates, Aristotle, and Galen, among others, only dissected animal bodies, not human. So man's internal structure was known primarily through analogy with animals, inferences from the externally visible structures, from natural philosophy, and from function. 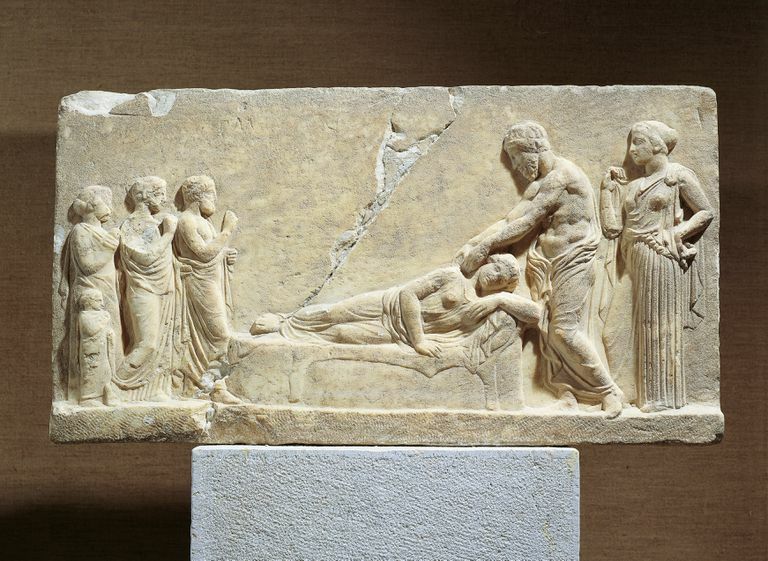 Such ideas might seem far-fetched today, but Hippocratic medicine was a great advance over the supernatural model that had preceded it. Even if individuals had understood enough about contagion to realize rodents were involved somehow, it was still the Homeric Apollo, the mouse god, who caused it. The Hippocratic etiology based on nature permitted diagnosis and treatment of symptoms with something other than prayer and sacrifice. Besides, we rely on similar analogies today, in Jungian personality types and ayurvedic medicine, to name two. These men demonstrated that when the nutriment becomes altered in the veins by the innate heat, blood is produced when it is in moderation, and the other humours when it is not in proper proportion.